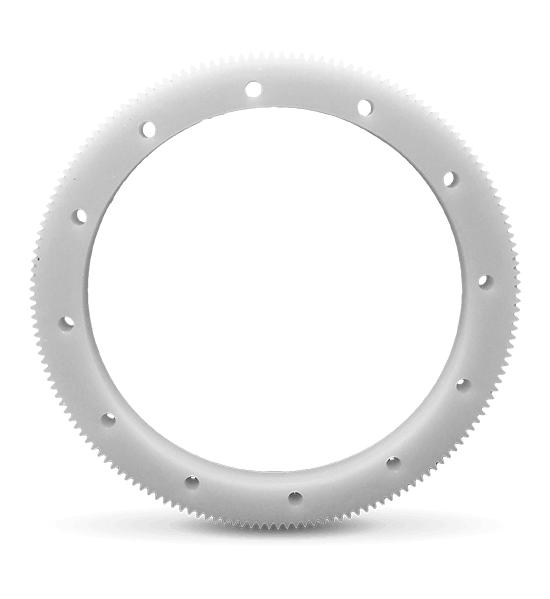 40-Inch diameter polypropylene gears for plating. Or ... Really big gears. We started with 2-inch thick polypropylene sheet. Polypropylene sheet is impervious to most of the harsh acids used for plating metals. Using a large N/C machining center, we cut the 40-inch round blank and interior mounting holds per the customer’s instructions. Finally, we souped up our gear cutter and engineered the software instructions to cut the teeth required for proper gear mating and rotation. Brand new really big gears, 40 inches in diameter, 2-inch thick (WHAT? ), 106 teeth and everything was pitch perfect! Bolt on the barrel with our machined mounting holes and it’s time to get plating!